Sentiments such as these were common at the Jewish LGBTQ and Ally Teen Leadership Retreat in early January, a joint project of Keshet and the Isabella Freedman Center, with support from the UJA Federation – and the second ever event of its kind. The weekend was a follow-up to the first LGBTQ Teen and Ally Shabbaton in August, when about a dozen LGBTQ Jewish teens and allies met for the first time to share their stories and make new friends. This winter, those teens, along with some new additions to the group, came together not only to create new memories as a now inseparable group of friends, but also to develop their leadership skills. 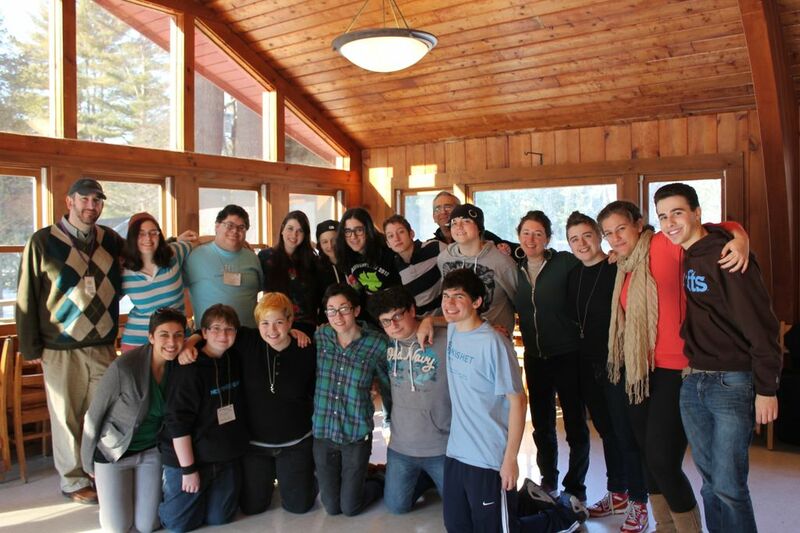 They also came together to begin to plan and design a future event that will attract close to 100 Jewish LGBTQ teens and allies, to create and connect a critical mass of change makers for the queer Jewish teen community. As a BBYO professional, I was privileged to be a part of staffing both of these gatherings. As the queer Jewish teen voice gains momentum, I am excited to learn how I and my organization can continue to be a part of the larger conversation on how the Jewish communal world can be more actively inclusive of, and better advocates for, our queer Jewish youth. As Rabbi Steve Greenberg, one of the weekend’s speakers, said: It is not enough to simply put a rainbow sticker on our doors and call ourselves inclusive. If we as Jewish youth professionals want to honestly say we are doing everything we can to fulfill our commitment to pluralism, and to work in accordance with the seven Jewish values Keshet articulates, we must take action now to provide a welcoming, loving home for these teens within our communities. My experience this weekend reminded me of just how important and urgent this mission is. However, my interest in these issues did not start there. On the first night of the retreat, we kicked things off by going around the room and sharing our personal journeys of what led us to be part of such an event. As a straight ally and adult staff member, my story was a little bit different from most. Unlike many others in the circle, I have never had to come out to my family and friends to reveal my true gender or sexual orientation. I have never been discriminated against because of who I loved or what box I wanted to check on a form. These issues have never been “my” issues but they are issues faced by a lot of people that I love, and issues that I have come to care about deeply. Last year, when one of the teens I work with came out to me, the question of how to be the best and most supportive ally possible became a professional, in addition to personal, one. Suddenly, I was not just an adult who happened to know and love a lot of queer adult friends. Now, in my professional role as someone who works with youth, I was being trusted with a teen’s deepest secret about his identity that he had not felt he was able to tell anyone else. I felt honored that he was confiding in me. But I didn’t feel prepared. I knew immediately that I would forever be a part of this boy’s story. The words I said, even the facial expression that I made, would impact his feelings of confidence and acceptance, and his decision about whether or not to further the coming out process. I didn’t want to screw up! In the end, I trusted my intuition. The conversation went well, and I was privileged that he continued to confide in me throughout the rest of his coming out to family and friends. However, the experience made me question why there wasn’t more specific training for staff who work with teens on how to handle situations like these, and why there weren’t more resources out there for Jewish LGBTQ youth that I could point him to. Coincidentally, this experience also took place just as I was beginning to look for a topic to study for my capstone project in BBYO’s Professional Development Institute, a graduate program where I am working toward an MBA in nonprofit management from Indiana University and a certificate in Informal Jewish Education from Hebrew College. As I approached my final year in the program, I was charged with identifying a research topic that would culminate in a proposal to BBYO on how to enhance or improve some aspect of the organization.
. Though I contemplated topics like a cost analysis of kosher food at conventions or best practices for hotel contract negotiations, I knew it was a “light bulb moment” when I realized I could explore how my organization and others like it can better serve LGBTQ youth within our programming. Half a year later, I have immersed myself in trying to come up with some good answers to this question. It turns out that even though BBYO and many Jewish youth groups have already won half the battle by pledging our support, there is still a lot of work to be done and many questions to be answered. For instance, what is the best way to train staff in using sensitive language, or combating homophobia? What are some best practices for gendered rooming at overnight conventions? Does a Gay-Straight Alliance have a place in youth groups? Ultimately, I think taking up this challenge in our organizations comes down to one main tenet of our religion: Do not stand idly by. A first and critically important step is signing the pledge by the same name. I am proud that many of BBYO’s teen leaders and staff have already pledged their names both individually and as a community. But it’s really about more than that. We cannot wait for blatant bullying or harassment to occur before we decide to take action. We must not stand idly by now, as teens are slipping through our reach and succumbing to feelings of loneliness and despair, maybe knowing that we will “tolerate” them, but not knowing that we will embrace them. As I’ve talked to teens and adults to seek perspectives on these issues and guidelines on how to move forward, many ideas have come to the surface. I look forward to talking to many more people about successes and challenges within their organizations and welcome readers to contact me at jleving@bbyo.org as my exploration continues.